It has been a week since I was able to blog, but I have a good (or not so good) reason. Life has been a bit crazy over the past week! We are very lucky that Liam is so healthy. 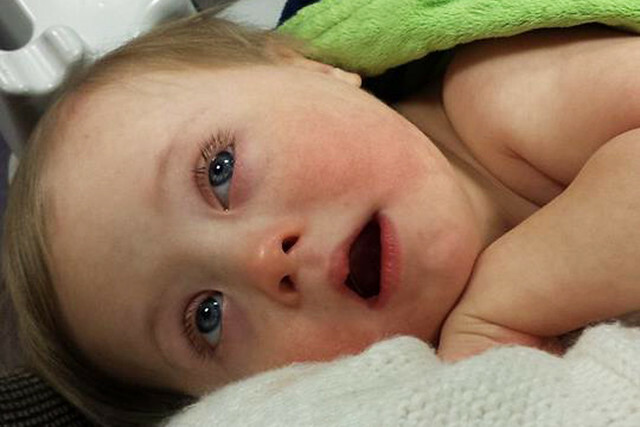 Children with Down Syndrome tend to have weakened immune systems. Thankfully, Liam is just like our other kids, and doesn't get sick often. The big difference is that the older kids tend to get mild illnesses and recover quickly. When Liam gets sick, he gets sick very quickly, and it hits him harder. Unfortunately, his good luck streak came to an end a few days ago. 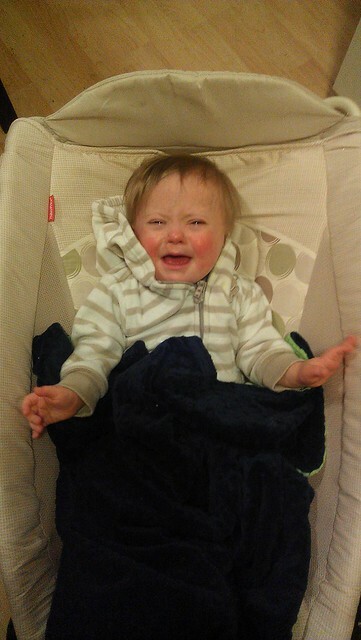 On Friday morning, Liam developed a low fever. We were visiting my parents, and my mom noticed he was tugging his ear. She suspected he had an ear infection, but I discovered his bottom molar had broken through. His fever went down with a dose of Tylenol, and he was fine all day. That evening, he spiked a fever again. Just like earlier, even though he had a low fever, he was acting perfectly normal. No other symptoms were present. He was eating great, nursing great, playing, laughing, and smiling. On Saturday, he was fever-free and acting like his usual self. I just assumed his molar was bothering him the day before, so we continued with our scheduled plans. He was fine! Around 7:00 that evening, I noticed he felt warm again. I took his temperature, discovered he had a fever, and gave him medicine to bring it down. 20 minutes later, he started coughing, and it sounded just like croup. Everything went downhill after that. By the time we went to bed, his breathing was loud and his breaths were quick. By 3 AM, his fever spiked to 105.3. That happened when he aspirated his milk and ended up with pneumonia last winter, and the doctor told us that high fevers often caused rapid breathing. We assumed his breathing was due to croup and the high fever. We treated his symptoms and monitored him, but he was still struggling at 8 AM. Grant and I were really worried at that point. I took him straight to the Urgent Care that is close to our house, as soon as they opened. I couldn't believe how quickly he went from acting normal to getting really sick. The doctor walked into the room, saw how he was breathing, and immediately called an ambulance. She gave him a breathing treatment as we waited, and explained that he probably had flu or pneumonia, and that a baby breathing the way he was could get worse very quickly. She was so nice, and kept talking, probably to keep me calm. The full impact of what was happening didn't hit me until the EMT wheeled him out on a stretcher, through the very full waiting room. Everybody was staring at us and saying they hoped he felt better, and I had to blink back tears. I have to say, I never expected that was how our morning would go! I expected a chest xray, antibiotics, or a breathing treatment. Instead, Liam and I ended up with our first ambulance ride ever. I hope we never have to do that again! Luckily, he fell asleep on the way, and the EMT didn't have to intervene. We chatted a bit about what they would probably do in the ER, and discovered that he actually transported Grant's dad when he was sick. As we neared the hospital, I was surprised to look out the back and see Grant trailing us. Grant somehow made it to Urgent Care, picked up my car, and caught up to the ambulance on the way! When we pulled up to the ER, the hospital looked deserted. The EMT who was driving opened the doors, and we heard a rush of water. Water was pouring out of the ceiling above us. A nurse came out and led us into the ER, where alarms were going off and strobe lights were flashing. It was completely empty, and looked like something out of a movie! Apparently a pipe burst just outside of the ER and set off all the alarms! So...our first trip to the ER was an exciting one! Grant came into the room before the EMT left, a nurse took Liam's stats and got him hooked up, and we waited for a doctor. Our poor little man was so sick. It broke my heart! 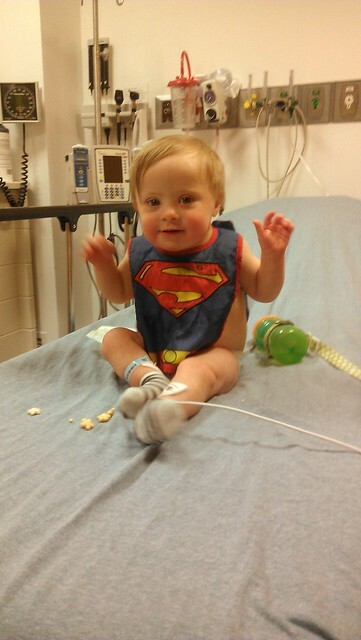 I was seriously impressed with the care Liam received in the ER. Not one, not two, but THREE doctors cared for him. They made sure someone came into the room every 15 minutes to examine him. 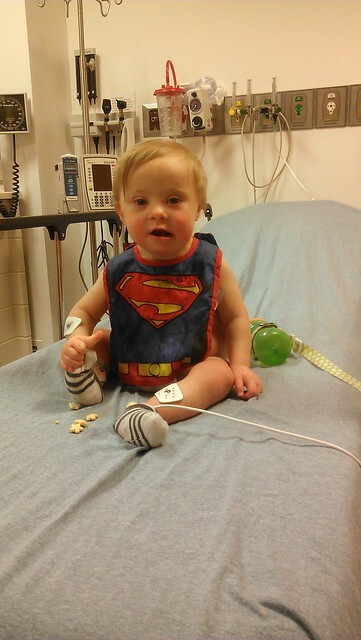 We have been to Children's Hospital of Pittsburgh many times for appointments, but this was our first visit to the ER. They did a rapid flu test and checked his lungs. They gave him medicine to bring his fever down, gave him an oral steroid, and started an Epinephrine (my phone apparently autocorrects this every time!) breathing treatment. Shortly after the treatment, Liam started to perk up a bit. The flu test was negative, and his lungs were clear. His chest was very congested and his nose started to run while we were there. 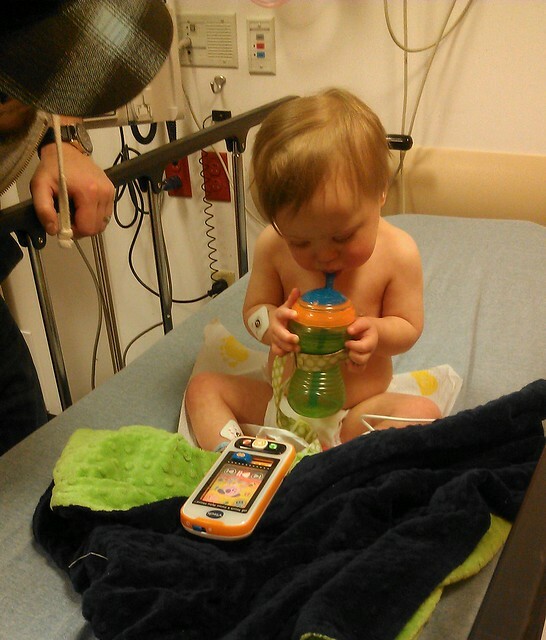 They diagnosed him with Croup, Bronchiolitis, and RSV. They said he could probably go home because his oxygen levels were good, but they had to monitor him for a few hours before we could leave. Liam was finally able to rest comfortably. By that point, it was afternoon, and we were starving. My amazing friend, Steph, showed up with food for us. She's just that awesome. Liam woke up, and had another first. First ambulance ride, first ER visit, and first time eating french fries!!! As we waited, we started to get a glimpse of our happy boy again! 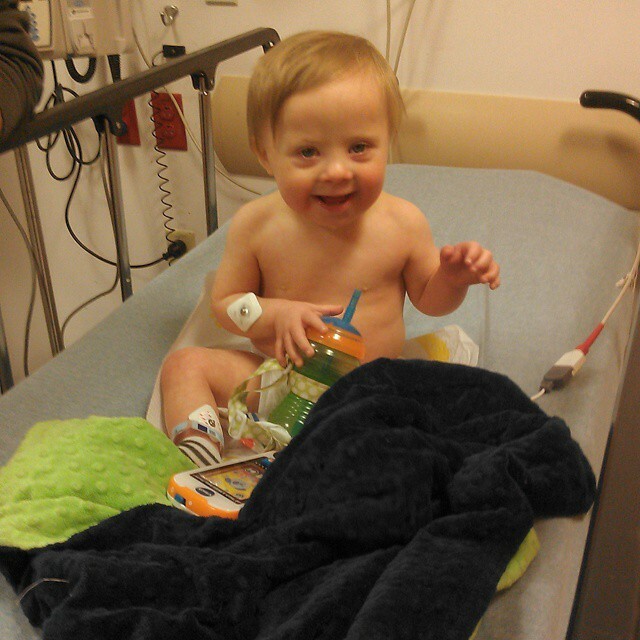 Liam remained stable, and was finally discharged from the ER after a very long day! We were so relieved to go home. 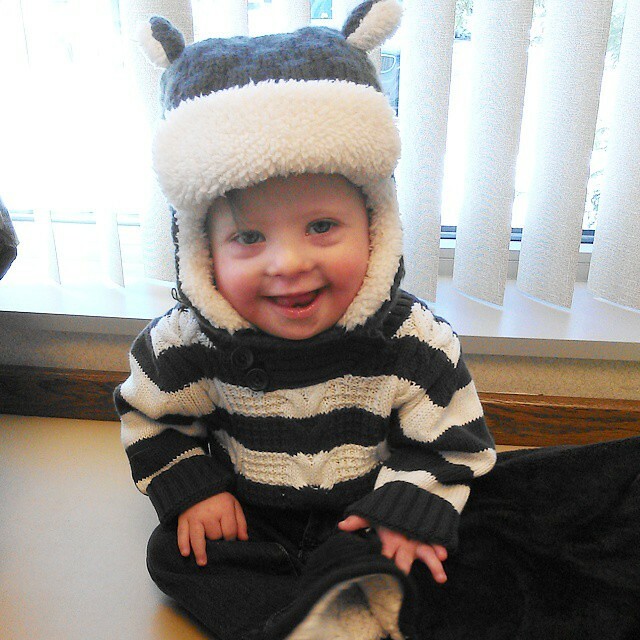 On Monday afternoon, we went to Liam's pediatrician for a follow up. His chest was still very congested and rattly, but he seemed to be improving. After we got home, he ate half a banana, and took a nap. When he woke up, he was struggling again. His high fever was back, he was coughing a lot, his breathing was very labored, and he whimpered and moaned for hours. He threw up everything he drank, and had diarrhea. He refused to eat or drink. He had another awful night, just like the one he had just before we went to the ER, so his pediatrician wanted to see him again. He definitely seemed more sick than he was when we were in the ER. Sure enough, he was really sick. 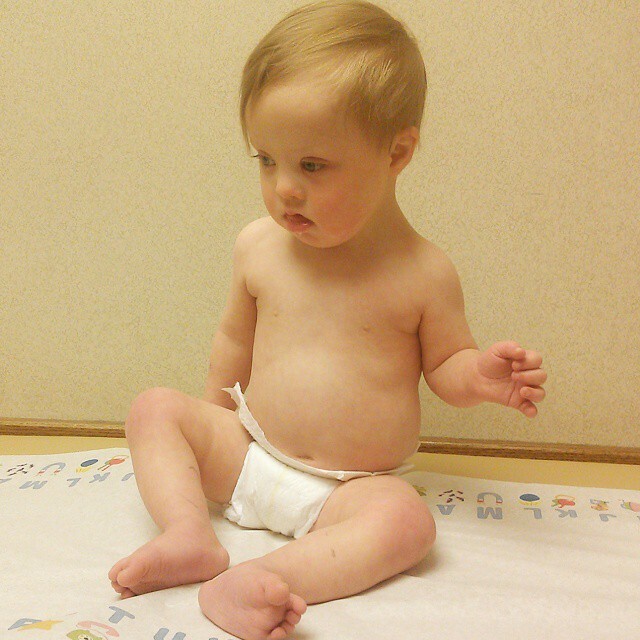 In addition to Croup, Bronchiolitis, and RSV, his doctor suspected he had a sinus infection. Surprisingly, his ears were completely clear! 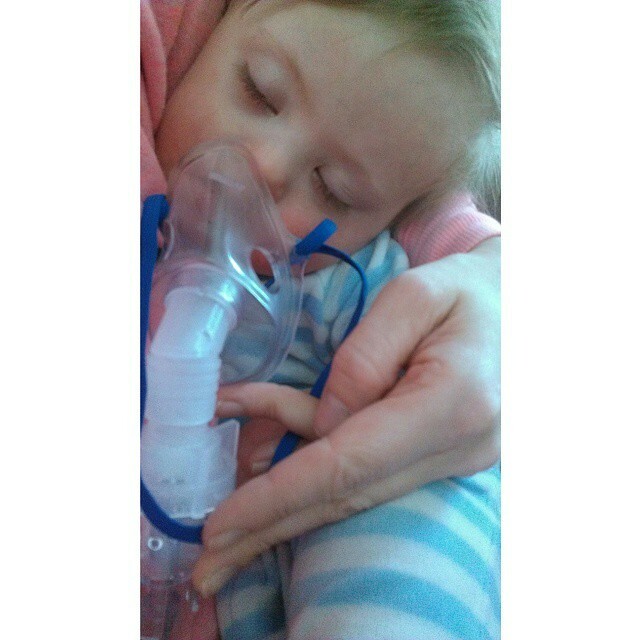 She gave him a breathing treatment in the office, and sent us home with a nebulizer, adult doses of albuterol, and an antibiotic. He was smiling a bit after his in-office treatment, but declined rapidly again. Yesterday was just awful. Liam was so sick. 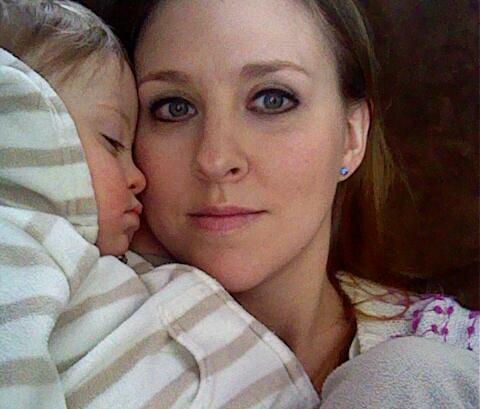 His fever never dropped below 103, and even with breathing treatments, he struggled to breathe. I've been saying for days that we have never had a child this sick. It really is draining and so hard to watch. I spent hours with him wrapped around my neck, because it was the only time he was comfortable. My human scarf is just the sweetest! 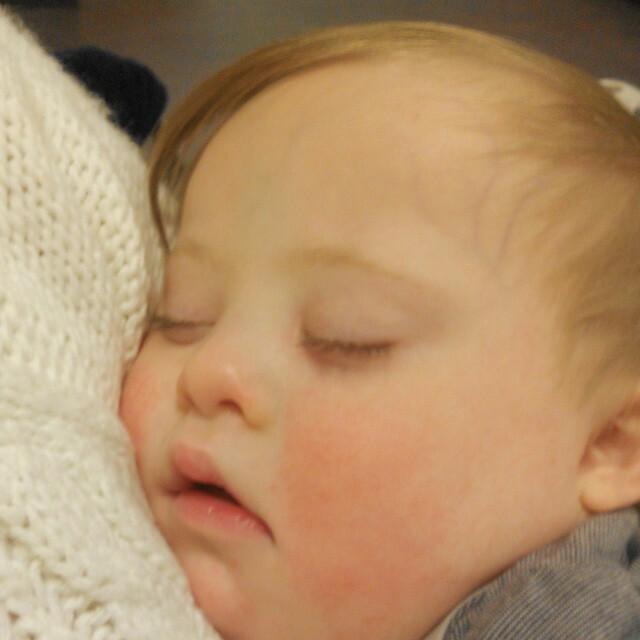 Liam cried from 4-8:30 last night, and finally fell asleep after a breathing treatment. He was so miserable! He had another rough night, and although his fever is lower today and he played for a few minutes, there isn't any significant improvement. 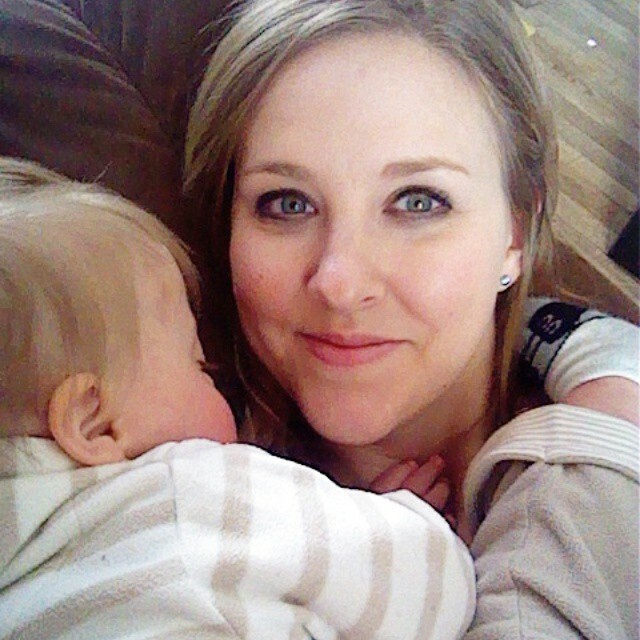 RSV, Croup, and Bronchiolitis is an awful combination! Liam doesn't get sick often, but when he does, he makes it dramatic! I'm praying he starts to feel better. He goes back to the doctor on Friday morning. Their ultimate goal is to keep him out of the hospital, and allow him to recover at home. We really miss our smiling boy who is so full of joy! Oh my gosh I am tearing up just reading this and watching your videos. Poor baby!! I just want to give him hugs! We are def. praying that he is healed quickly and that you get sleep and strength to make it through! Thank you for the prayers! They helped! Poor Liam and mommy. You're doing a wonderful job caring for your sweet boy. I'm a pediatric nurse (I work in-patient at a big medical center) and the little ones being admitted with RSV this winter are so sick. We are constantly talking about how sick they are. 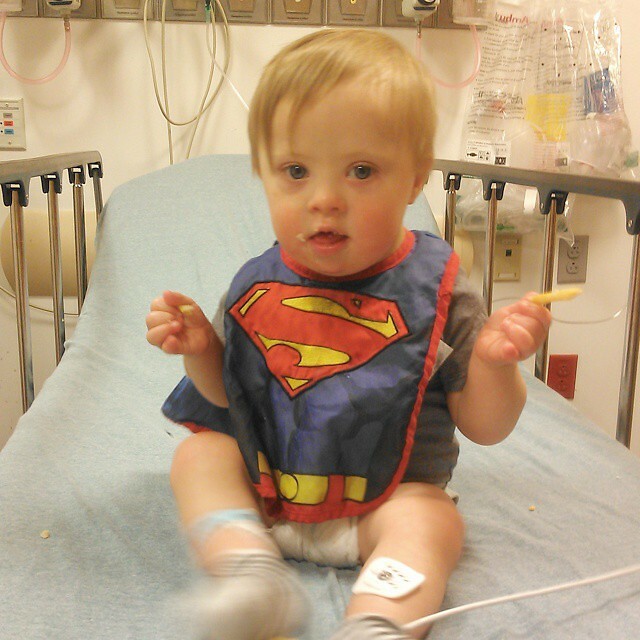 Staying on top of his fever and breathing treatments is the key to keeping Liam home. I'll say a prayer for your strength to get through all this and for Liam's total healing! Thank you so much! I know so many kids who got REALLY sick this winter! Oh my, I can't even imagine!!! Poor sweet babe!! Sending lots of love and hugs your way!! Oh wow! I will pray for you guys... that is a really scary couple of days! I hope that Liam recovers quickly so you can all relax. He sweet little body wrapped around your neck is about the cutest thing, if only he wasn't so sick! Sweet sweet Liam. May you feel so much better soon. Praying for a speedy recovery........ Poor Liam feel better fast! Good Job Mom your the greatest! Poor little guy, I hope he gets to feeling better soon. Thank you! It was rough, but he bounced back! Hope he gets to feeling better soon. Stay strong and know many people are praying for him and your family. Poor little dude! I've been thinking of you all week, hope he's feeling better. Thank you! It was a rough week, but he bounced back! I know that must have been terrifying. Poor Liam. He looked like he felt awful. Hope he is very much on the mend! Thank you! We're hoping we can avoid the hospital the rest of winter!